Now when you search for a part after expanding a BOM line, the unit price and how many units are available for that part will show up in the results. We'll also let you know if there is a minimum order quantity (MOQ). This way you can avoid having to go back and find substitutes for your parts after you've already reconciled your product. We're constantly working on improving BOM reconciliation so that you have to do as little work as possible. We've improved our algorithms so that they can better detect the part specifications given by your EDA tool. 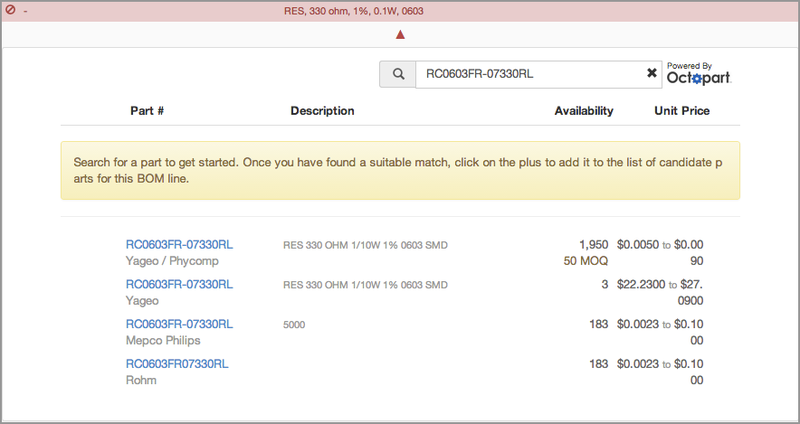 CircuitHub uses the different fields including part number, manufacturer, footprint value and value given by your EDA tool to automatically reconcile your BOM. CircuitHub also takes data from other reconciled projects on CircuitHub to suggest possible part substitutes. Quick tip: If CircuitHub did not capture your part number but you have it listed in another value field, go to the left sidebar where all the value fields are located. Click on the one that contains the search terms you would like to use to find your part. The field will automatically be copied and pasted into the Octopart search bar so you don't have to do it manually. Have you noticed improvement when reconciling your BOM? What other features would you like to see? Let us know!